The simple way to organize your sounds. 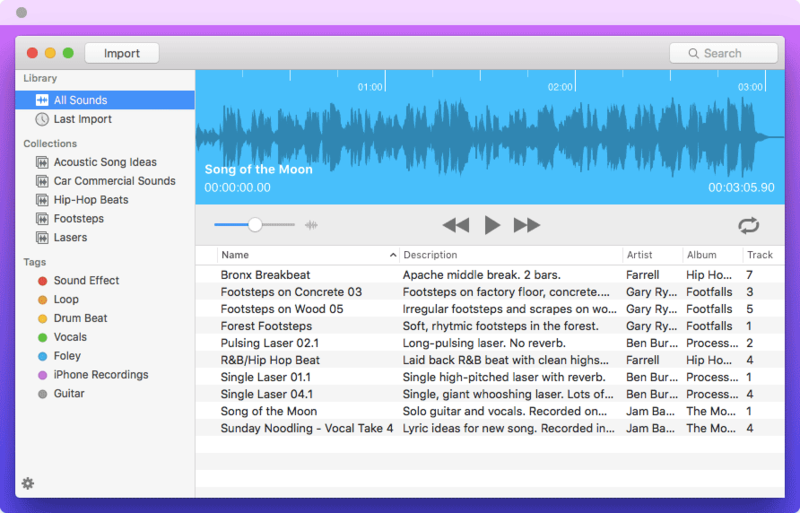 Built for editors, sound designers, musicians, producers and sound professionals–Cellar is the missing sound assistant for OS X. Spend less time managing media and more time creating. Cellar is built to capture and organize your library of sound effects, beats and loops. Stop digging through endless folders to pull up that perfect sound. Cellar’s blazing fast search will find the sound you need. When you’re looking for inspiration, quickly audition all of your sounds and use the visual waveform to seek to the right spot. 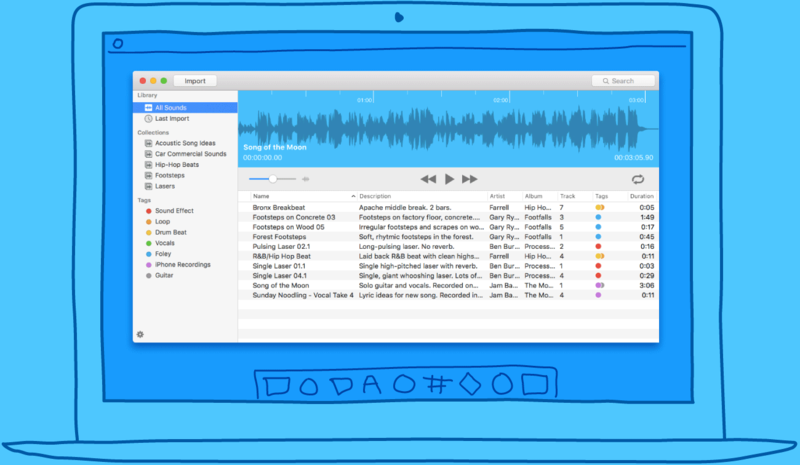 Capture all of your audio files into one place. From there, sort them into Collections and label them with Tags. Once you’ve found the sound you need, you can get it into your cut with a simple drag and drop. If you have uncovered a bug or are experiencing an issue please contact us. Please include your machine specs, the version of OS X you are running in addition to a description of your issue. If you have feature requests, suggestions or feedback for Cellar, go ahead and drop us a line. We’d love to hear what you have to say. How much does Cellar cost? Cellar is free and available in the Mac App Store. Will Cellar replace ProTools, Logic, etc.? Cellar is designed to work alongside these great tools. It's built to get you to the sound you need quickly so that you can get back to the edit. If you haven’t uncovered a feature and don’t see it in our feature list, let us know. We are continually adding new functionality and want to know what you would like to see in a future release. Will Cellar make me a great musician, sound designer, editor, etc.? We can’t guarantee that, but Cellar is designed to help you do those things better and faster. Cellar will run on any Mac running OS X 10.10 or newer. What are the supported audio file types that Cellar can read? Cellar can read any audio format supported by OS X. That includes WAV, AIFF, AAC, mp3, Apple Lossless, and many more. What does Cellar do with the files I import? You decide. You can configure Cellar to copy all of your audio files and completely manage all of your media. You can also tell Cellar to leave the files in place. Which programs are compatible with Cellar? You can use Cellar alongside any audio or video editing application that supports drag and drop import and editing. Add your email to receive infrequent updates and news on the latest features added to Cellar.